Looking along Darwen St and into King William St, with the junction of Church St to the right and Higher Church St to the left. 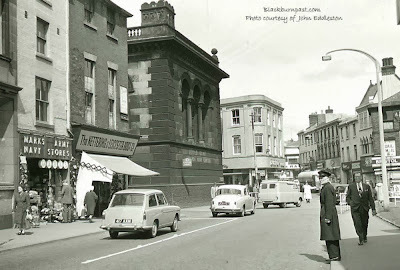 The Old Bank, pretty central in this photograph, dominates the scene and just in the centre of the crossroads, you can see the policeman in his white coat, directing the traffic. The building on the other corner of Higher Church St was originally the Prince of Wales Hotel, but by the time this photo was taken in 1963, it had long been an outlet of Burton's (gents outfitters). Hi, does anyone know anything about the Messrs Furness who owned 39 to 49 Kings William Street and 6 to 12 New Market Street in the 1930s?